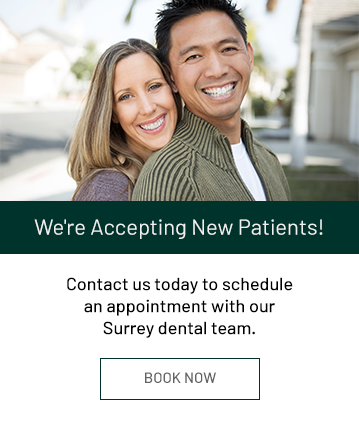 Guildford Smiles Dentistry in Surrey applies dental inlays and onlays to repair larger cavities on the molars. Porcelain inlay and onlay restorations are large fillings usually made from composite material, gold, or tooth-colored porcelain. Porcelain inlays and onlays are popular because they closely resemble natural teeth in colour and texture. They are made in a professional dental laboratory and are permanently cemented into the tooth by your dentist. Inlays and onlays are used to conservatively repair teeth that have large, defective fillings or have been damaged by decay or trauma. Inlays are a great alternative to conventional silver and composite fillings. They are more conservative than crowns because less tooth structure needs to be removed in the preparation for them. Onlays are also an ideal alternative to crowns for the same reason. Onlays are very similar to inlays with the exception that one or more of the chewing cusps have also been affected by decay or damage, and need to be included in the restoration. What dental problems can inlays and onlays resolve? Inlays and onlays can be used to remedy a variety of dental problems, including breaks, fractures and decay, and to replace older fillings that are large in size. They can also be used for cosmetic enhancements.